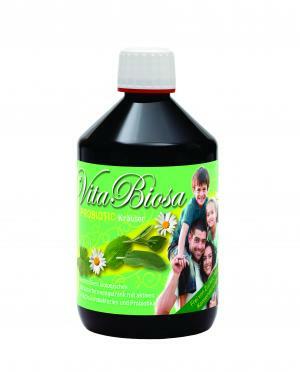 Vita Biosa is a mixture of aromatic herbs and other plants, which are fermented by a special combination of lactic acid and yeast cultures. Lactic acid bacteria are a group of related bacteria that produce lactic acid as a result of carbohydrate fermentation. The production of lactic acid gives a low pH value of about 3.5. The low pH prevents the development of harmful bacteria in the finished product. Vita Biosa contains no sugar - as the lactic acid bacteria have fermented the sugar, making it suitable for diabetics. Vita Biosa is a live product, formed through natural processes, thus the colour and taste of Vita Biosa varies between productions. Vita Biosa is still â? ?aliveâ? when bottled and will, like wine, alter its flavour with time and after the bottle has been opened. Vita Biosa can produce carbon dioxide, causing an increased pressure in the bottle and a sparkling effect. Before opening there are no special requirements but we recommend that Vita Biosa is stored in a dark place at a constant temperature. Overpressure can arise at temperatures above 18CÂ°. Vita Biosa can be stored for a period of at least 12 months after production (see label on the bottle). After opening Vita Biosa needs to be stored in a dark and cool place below 8CÂ° otherwise white-yellow flakes can appear on the surface. They are not harmful and are easily removed. The storage period after opening is about 1 month. By rebottling Vita Biosa into smaller bottles the keeping period is lengthened. Sediment can form at the bottom of the bottle which can gently be shaken up before use. Recommended Use: Adults daily 30-50 ml, Children 1 year old and over täglich 15-30 ml. To be mixed with water. Also suitable for diabetics. Vita Biosa does not contain any sugar as the sugar is converted into lactic acid and acidic acid bacteria during the fermentation. Vita Biosa does not contain any milk components, unlike other products containing lactic acid cultures.